Submitted by Yoshimoto on February 8, 2008 - 9:03pm. Looks like something out of a horror movie. Just standing there, staring. Submitted by Jay on February 8, 2008 - 10:09pm. Submitted by Ghede on February 9, 2008 - 5:56pm. What would make it funnier? After a few seconds, everybody whispers "surprise"
Submitted by CursedKreon on February 10, 2008 - 12:11am. Submitted by Zombiedude on February 12, 2008 - 10:16am. I giggle everytime i see the last panel. Submitted by brakoth on March 5, 2008 - 1:55am. he seems....a bit disturbed. as would i in that situation. then i would back out slowly and close the door. Submitted by hazy on May 17, 2008 - 5:19pm. Submitted by Mew_chan on October 6, 2008 - 8:41pm. Submitted by FCCommunist on November 13, 2008 - 5:27pm. Submitted by Amake on November 30, 2008 - 4:21am. 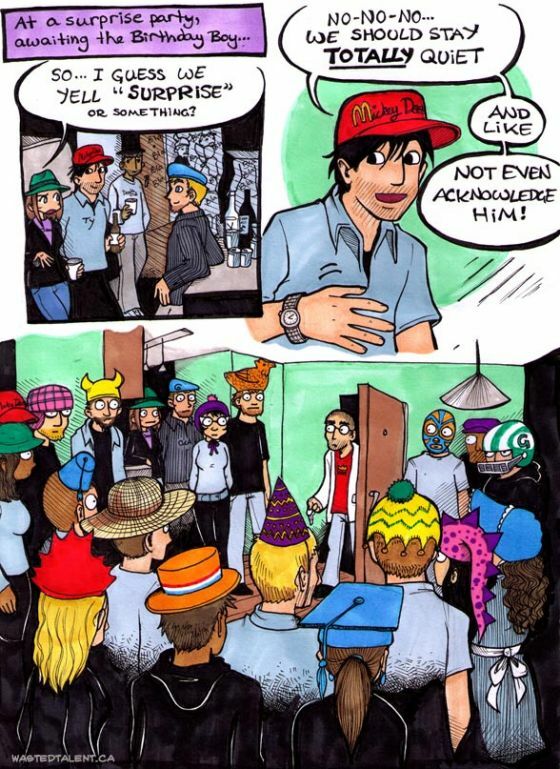 This comic makes me want to have a large group of friends solely to do this to one of them on their birthday. I loves a good prank. . . Submitted by Dragons777dr on December 20, 2008 - 3:51am. Submitted by Mr Awesome on January 3, 2009 - 10:18pm. Submitted by razorknight on January 28, 2009 - 6:43pm. Submitted by candeh on March 26, 2009 - 1:09pm. Submitted by interwebman on April 23, 2009 - 7:58am. my friends had a better idea. we ignore him completely until he gets sad, then we start laughing!!!! Submitted by bearpelt on August 21, 2009 - 11:37pm. Submitted by Momo on October 6, 2009 - 8:34pm. Submitted by r21187 on January 8, 2010 - 2:03am. hell yeah i will do this right now! Submitted by Tesa on February 2, 2010 - 9:19pm. Submitted by AlmostLiterally on March 3, 2010 - 2:18pm. I like how the people at the back sort of look like they are all in a cult or something.